The annual Leonid meteor shower will peak this week, and every year, skywatchers hope to catch stunning displays of ultrafast meteors streak across the sky. This year is no different, but it comes on a special anniversary — the 45th anniversary of the Great Leonid Meteor Storm of 1966. Forty-five years have come and gone and it still hurts. In 1966, one of the most stupendous Leonid meteor displays ever witnessed took place over central and western North America. The Leonids occur every year on or around Nov. 18, when Earth glides through a diaphanous trail of dust left behind by the comet Tempel-Tuttle. 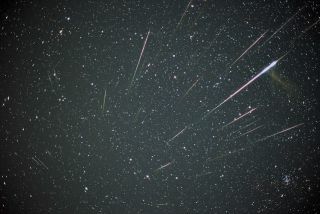 Each year, stargazers are tempted with a drizzle of maybe a dozen ultrafast meteors streaking across the sky every hour. But, every 33 years or so, a rare and dazzling Leonid storm can occur after the comet swoops near the sun, closely followed by thicker concentrations of dusty, icy particles no larger than the size of Rice Krispies. Earth then plows straight through the comet’s refreshed wake, producing a stupendous meteor display. 1966 was one of those special years. And I missed it! There I was forty-five Novembers ago, standing in my backyard late on a Wednesday night in the Throggs Neck section of The Bronx, cursing the heavens. My grandfather stood at my side, just shaking his head and murmuring two words over and over: "Too bad." The previous weekend, we had visited the Hayden Planetarium in New York where Dr. Fred C. Hess, an astronomer, who was also a powerful orator, urged us to be sure to look skyward after midnight on Wednesday for — potentially — a spectacular display of "shooting stars." In the "pretend universe" of the planetarium’s domed sky theater, we were told that given reasonably clear skies, we might see hundreds, or maybe even thousands, of meteors per hour. We then were treated, using Hayden’s famous Zeiss star projector, to a re-enactment of the stupendous 1833 Leonid storm, where in the span of a single night over North America, an estimated 250,000 meteors rained down from the sky. Needless to say, I couldn’t wait for Wednesday to come; I was "wired" for the Leonids. So, after coming home from school that afternoon, I did all of my homework, had an early dinner and then, before getting a few hours of sleep, watched the local TV weather reports, which were all promising no worse than "partly cloudy" weather for prospective skywatchers. When my alarm clock rang at the stroke of midnight, I bundled up and, with my grandfather in tow, anxiously ran outside to watch the promised celestial pyrotechnics display. But, I was met instead with cloud-filled skies and not a star to be seen. After a few minutes, I sobbed to my grandfather, "But they promised it was only going to be partly cloudy tonight." To which he sadly replied, "I guess the party is over." That night at Central Park, at a midnight meteor watch, an estimated 10,000 people were looking at the same cloud cover. Grandpa and I trudged back inside. He went to straight to bed, but I stayed up for the rest of the night, hoping for a break in the clouds that never came. I was 10 years old and it was the first time I had ever pulled an all-nighter. I went back to my room and tuned in WNBC radio, where an all-night talk show, hosted by a chap named Long John Nebel, was in progress. Nebel was immensely popular, with millions of regular listeners and a fanatically loyal following to his nightly program, which dealt mainly with anomalous phenomena, UFOs, and other offbeat topics. It was announced in the newspapers that on the night of the Leonid shower, Nebel would be talking to the chief astronomer at New York’s Hayden Planetarium, Dr. Kenneth Franklin, who had the foresight to be above the clouds in an aircraft. Franklin planned to report on the Leonids to a New York radio audience. But, as the hours passed, it appeared that even from the plane, the Leonids were not very active. Finally, around 4 a.m., Dr. Franklin announced that his plane was returning to La Guardia Airport and that he was calling it a night. And so did I.
Ironically, right after that, the fireworks began! Eyewitness accounts can be found here. Beginning at around 5 a.m. Eastern Time, Leonid activity suddenly began to ramp up. Along the Eastern Seaboard, the dawn sky was brightening, and where clear skies prevailed, viewers were able to see Leonids falling at rates of up to six per minute before it finally became too bright to see the stars. Perhaps the best views were from California and Arizona. At the Table Mountain Observatory, near Wrightwood, Calif., one resident astronomer commented that he and a colleague, " ... watched a rain of meteors, turn into a hail of meteors and finally a storm of meteors, too numerous to count by 3:50 a.m. Pacific Time. Instinctively, we sought to shield our upturned faces from imagined celestial debris." From 6,850-foot Kitt Peak in southern Arizona, thirteen amateur astronomers were trying to guess how many could be seen by a sweep of their heads in one second. The consensus of the group was that the peak occurred at 4:54 a.m. Mountain Time, when the staggering rate of 40 per second (144,000 per hour) was reached! Today, we know that a dusty trail of debris shed by comet Tempel-Tuttle back in 1899 was what caused the Great 1966 Leonid Storm. The dusty material had made two revolutions around the sun before colliding head-on with the Earth on that memorable night 45 years ago. Because such a trail of cosmic flotsam and jetsam is invisible until it enters our atmosphere, astronomers were, in essence, playing a game of blind man's bluff, not knowing exactly if or when we might encounter it. Today, with computer technology, it's a much different situation: Now, astronomers can readily locate the position of Leonid dust trails from the distant past or far into the future. Indeed, the Leonids will periodically shower our planet in the years to come; in the year 2034, Earth is forecast to move through several clouds of dusty debris shed by comet Tempel-Tuttle from the years 1699, 1767, 1866 and 1932. If we’re lucky, we might see Leonids fall at the rate of hundreds per hour, perhaps briefly reaching "storm" rates of 1,000 per hour, experts have estimated. But sadly, in the year 2028, Jupiter is expected to throw comet Tempel-Tuttle off from its current path through space, making it all but impossible — at least through the beginning of the 22nd century — to see a repeat of the Great Leonid Storm of 1966.